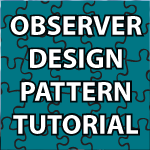 Welcome to my Observer Design Pattern Tutorial. I cover a lot in this tutorial including the Observer pattern, how to use it with threads and much more. The Observer pattern is a software design pattern in which an object, called the subject (Publisher), maintains a list of its dependents, called observers (Subscribers), and notifies them automatically of any state changes, usually by calling one of their methods. I can see my comments here only if I provide my name and email. Now this comment is only to enable me see my previous comment and responds if any. I use (Firefox & Google Chrome). Am I getting this right? In the threaded version of the code, all that the runnable object does is to change the stock prices eh? As soon as a thread changes the stock price, the original notifyObserver() is called on the stockGrabber which then sends an update wave invoking the registered observer’s update right? P.S. Derek, I absolutely love your vidz, I am following the GoF and HFDP along with your vidz and they work fantastically well. Things that I don get in GoF – you make em so clear thru the tutes. God bless you for such wonderful work. Can There Be Multiple Subjects?? I know I am asking way too much here. But do you think it would be possible to make some vids on big-data and stuff. I mean, say the first few lectures are more of ppts of Hadoop etc. And then slowly you get into mapreduce stuff. And show some examples, say the word count problem or terasort may be! It is so much in demand these dayz – any company that I interview with throws in a couple of questions on hadoop etc. Best videos on this topic by far!!! Fast, Clear, and to the point! I am translating them to vb.net and Spanish and have been successful so far (observer and strategy) to use in my vb.net class as exercises for the students. Before your videos, I was not able to clearly understand any of the design patterns. What is the best way of changing the code so that the observers are only monitoring one of the three stock (each its own)? Best explanation of design pattern ever !! This tutorial is very helpful! But I am having problems understanding it as I do not know java. Do you have a copy of this code for C++ instead of java? Or do you have a link to another observer tutorial for c++? I have been looking around for one but none of them are as good as your tutorial. Sorry, but I don’t have a C++ version of my design patterns tutorial. I will cover C++ at some point and cover it again. May I ask why in the uml diagram IBMPrice and AAPPrice look like class that extend Observer. As you mentioned there is loose coupling between observer and subject but from code it seems that they are tied with each other..can you please clarify. Apology in advance for my absurd question. That isn’t an absurd question. When trying to avoid coupling there are always trade offs. The goal is to eliminate dependence as much as possible, but you still need to provide a way for objects to interact. With experience you’ll learn to find the sweet spot that you are most comfortable with. Thank you very much for such a nice series of lectures. I have almost gone through all of your lectures on design patterns. They are wonderful and knowledge increasing. One thing that I can not understand is that in the uml the IBM and AAPLprice are shown as classes whereas in the code I don’t see anything like a class by these names. Will you please make it clear what is it in reality. Appologies in advance for this question if it does make a sense. Im quite new at programming and theres something i cant understand. Why arent “events” used in the observer pattern(java) like it is in c#. Basically im trying to figure out the main differences between observer pattern in java vs c#. Hi Derek, I have observer pattern working which updates the GUI. I am in a situation where my model completes an operation and it wants to ask user if they want to save the results? It notifies GUI to bring up this dialog but I think GUI sending feedback from this notification would be against the norms and will cause problems (it will send all observers to display the dialog for a start which is bad!). Should the ‘SaveResults’ thing be launched from GUI after operation is complete? This operation (Say Operation1)can be performed from several dialogs and I would like it to have the same behavior of asking user if they want to save results. Can I package that as re-usable code somehow? Thanks. ” Exception in thread “Thread-1” Exception in thread “Thread-0” Exception in thread “Thread-2” java.lang.NumberFormatException: For input string: “677,59” “. I’m guessing this has to do with me living in Sweden where we use commas to separate the decimals instead of dots? If that is indeed the case, how could I make it work? I took exact code but till 18th line of GrabStock.java to check simple (without threading) functionality. Sir, got the error fixed. StockGrabber constructor was missing from my code to instantiate ArrayList. Try copying all the code that is under the video. That should solve that problem. Keep it up. You are a brilliant teacher. Hello Germany 🙂 Thank you very much. I’m very happy that I could help. Thank you very much 🙂 I’m very happy that I can help. Good Explanation ! Worth Watching. Thanks a ton. U can include examples of Design Patterns used in JDK since its based on Java in each pattern. I have been trying to apply patterns on a simple project that I am working on. I have this make make payment page on my app and I need the different fields like Card holder name, card number, expiry date and cvv to listen to keypad which is the subject. I am not sure if observer pattern is the best I can use here. I need only the name field to be updated wen I enter a name on the keypad object but I am making all by observers get notified about it through this observer pattern. Is it the right way to implement. Please help me and correct me if I am wrong. Thank you very much 🙂 The goal is always to use patterns only when they make code more readable and flexible. If you ever feel as if you are complicating your code through the use of a pattern then it probably shouldn’t be used. I have an object oriented design tutorial that may help? U are really amazing… Ur explained is too good and simple. All these days I was thinking design patterns as Mount Everest. U made it simple. Thanks a lot. Thanks a lot for amazing set of tutorials. You’ve really helped me pass my exams with these tutorials!